Although too many Oregonians are not experiencing economic recovery, the available data show that the recession would have been worse but for the American Recovery and Reinvestment Act of 2009 (the Recovery Act, or ARRA). Signed into law by President Obama in February of last year, the act has preserved and created jobs in Oregon while spurring economic activity in the state. Key in the Recovery Act’s positive economic impact have been five provisions that have put money in the hands of individual Oregonians likely to spend it quickly, thereby pumping more than $1.5 billion dollars into Oregon’s economy. These five major direct assistance provisions are (1) the expansion of Supplemental Nutrition Assistance Program (SNAP, formerly known as the food stamp program) benefits, (2) an increase in the amount of unemployment insurance benefits, (3) an extension of unemployment insurance coverage periods, (4) a cash payment to elderly and disabled Oregonians and (5) the Making Work Pay tax credit. Along with aid to states, these provisions were the act’s primary tools for confronting the recession in 2009. The Recovery Act has protected thousands of Oregon families from the worst of the recession’s effects and has helped stabilize Oregon’s economy. While Oregon and the nation have yet to achieve a solid recovery, that does not mean that the Recovery Act failed, as some have suggested. The recession turned out to be longer and deeper than many anticipated, and few promised that the Recovery Act was a silver bullet. But as the five provisions discussed in this paper show, the Recovery Act has generated economic growth and saved and created jobs. The Recovery Act has made significant strides toward achieving its two primary goals: to create and save jobs and spur economic activity. In doing so, it has helped cushion the blow for Oregon families hit by the recession. The Recovery Act has generated economic growth. According to both federal government analysts and independent economists, the act boosted the nation’s real gross domestic product by 2 to 3 percentage points in the last three quarters of 2009. There are no estimates of the specific impact on Oregon’s economy. The Recovery Act has also preserved or created jobs. Nationally, the Council of Economic Advisors (CEA) estimates the number of jobs created or saved at between 1 and 2 million through the end of 2009. 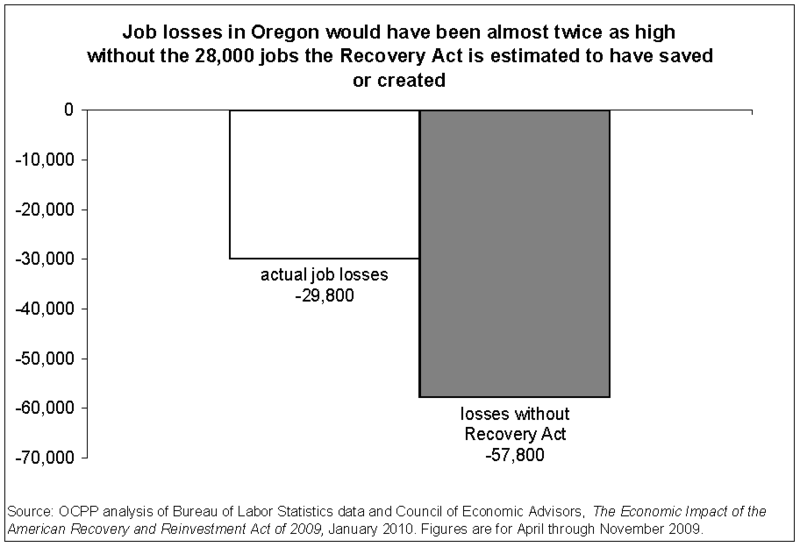 In Oregon, the Recovery Act saved or created about 28,000 jobs by the fourth quarter of 2009, according to CEA estimates. Some jobs have been saved or created directly, with federal funds being used to hire workers or maintain existing positions. For example, the act has channeled funds to into infrastructure projects such as highway construction, thereby preserving or creating jobs in the public and private sector. The act has also provided significant assistance to state and local governments, helping them not only to maintain services but also to preserve and create public- and private-sector jobs in areas such as education and human services. The Recovery Act has also helped to preserve and create jobs indirectly, by giving tax cuts or benefits such as food stamps to households, which helps sustain their ability to purchase goods and services. Determining the Recovery Act’s effect on employment entails more than simply counting jobs. Total job creation figures are estimates based on statistical models. Some Recovery Act jobs can be counted. Recipients of grants, contracts and loans are required to report the number of jobs created or retained as a result of federal funding. That information appears on federal and state Recovery Act websites. In Oregon, recipients reported more than 18,400 jobs created or retained through December 2009. The jobs reports by funding recipients, however, account for only a portion of the total Recovery Act jobs created or retained. The reports cannot account for jobs created indirectly, as workers spend their wages in the community or as businesses supply goods and services to projects receiving Recovery Act funds. In addition, recipient reports cover only about 35 percent of total Recovery Act spending. The bulk of the Recovery Act money has flowed through tax benefits, extra Medicaid support to states and direct assistance to households. In such programs, actual job counting is difficult or impossible. To better gauge the full impact of Recovery Act spending on employment, economists turn to statistical models — an inherently uncertain endeavor. Modeling the effects of stimulus spending requires making assumptions, albeit informed assumptions, about the magnitude and timing of economic effects. That stimulus spending is ongoing adds uncertainty to the analysis, as does the fact that the unprecedented scale of the recession and of Recovery Act spending make past experience less reliable for evaluating the current situation. Estimating impacts at the state level is even less precise because it involves allocating national estimates among states. Few state-level estimates are available. The President’s Council of Economic Advisors (CEA) used three different methods to allocate its estimate of total, national employment across states, based on data available through the end of 2009, then averaged the estimates to report state-level job impacts. For Oregon, the CEA estimated 28,000 jobs created or retained for April through November 2009. By comparison, several Oregon state agencies projected in October 2009 that Recovery Act funding would produce about 30,000 jobs in Oregon in state fiscal year 2009-10. While we cannot know exactly how many jobs have been created or retained nationally or in Oregon as a result of the Recovery Act, informed and best estimates show that the number was substantial. Comparing estimates by government and private economists serves as a check on the reasonableness of any one estimate. On that basis, it is safe to say that as bad as unemployment was in Oregon in 2009, it would have been worse but for the Recovery Act. Expansion of food assistance benefits. The Recovery Act implemented a 13.6 percent increase in monthly Supplemental Nutrition Assistance Program (SNAP) benefits. For most eligible four-person families, the increase means an additional $80 in benefits each month. Growing numbers of Oregonians have benefited each month from the increase. In April 2009, when the increase went into effect, about 590,000 Oregonians relied upon SNAP benefits. By January 2010 the number had grown to more than 680,000. Cash payments to elderly and disabled. The act provided a one-time, $250 Economic Recovery payment to recipients of Social Security, Supplemental Security Income, Railroad Retirement and disabled veterans' benefits. More than 675,000 Oregonians received this $250 payment. Extension of unemployment insurance benefits. Emergency Unemployment Compensation (EUC) is a temporary program, initiated in 2008, that provides additional weeks of unemployment insurance benefits. EUC was originally scheduled to end in March 2009, but the Recovery Act extended it through the end of 2009. Congress has since extended it through March 2010 and is considering a further extension. Increase in unemployment insurance benefits. The act increased the weekly unemployment insurance benefit amount by $25. More than 385,000 Oregonians have benefited from the unemployment insurance provisions in the Recovery Act (both the extension and the increase in benefits). A new tax credit for workers. The Recovery Act created a new tax credit, the Making Work Pay credit. The credit is equal to 6.2 percent of workers’ earned income, up to a maximum of $800 for couples filing jointly and $400 for single filers. The credit is in place for 2009 and 2010, and most workers get it via a small increase in each paycheck, as employers reduce withholdings. The credit is refundable, meaning that workers receive the full amount even if it is more than they owe in taxes. About 1.3 million Oregon taxpayers are estimated to benefit from the credit. These five major direct assistance provisions have brought thousands of federal dollars into every county of the state, protecting and creating jobs and bolstering economic growth. The success of the five major direct assistance programs derives from two factors. First, they have placed money mostly in the hands of those who will spend it quickly, thereby getting dollars to circulate in the economy. And second, the funds were dispersed quickly and efficiently because they used existing delivery mechanisms. The effectiveness of government stimulus funding hinges on getting the dollars circulating in the economy, and that means putting money in the hands of people who will spend it, not save it. A family receiving unemployment insurance benefits or food assistance through SNAP, for example, will spend the money at their local grocery store, gas station or other businesses. That enables those businesses to retain their existing employees or hire more workers. Those workers in turn are able to maintain their spending in the community. Thus, the assistance program creates a snowball effect in the economy. Food stamp and unemployment insurance benefits are particularly effective in this regard. They target low-income families and unemployed workers, who are likely to spend the benefits immediately to meet basic needs. Such programs offer a good “bang for the buck.” By one estimate, every dollar spent on increased unemployment insurance benefits produces $1.61 in total, national economic activity and every dollar spent on increased food stamp benefits produces $1.74 in total economic activity. The other two direct assistance provisions were somewhat less well targeted at those most likely to spend it immediately. The Economic Recovery payment reached anyone who received a Social Security payment, regardless of wealth or total income. Yet it also reached many Supplemental Security Income recipients and disabled veterans, who tend to have lower incomes. Although the new Making Work Pay tax credit also reaches many higher-income workers, limiting its effectiveness, it incorporates features that encourage spending. First, the credit is delivered though reductions in tax withholdings, so workers take home a bit more in each paycheck. That makes it more likely that taxpayers will spend the money. Had the credit been paid as a lump sum, taxpayers would have been more likely to save the money or use it to pay down debt, neither of which stimulates the economy. Second, the credit is refundable, so low-income taxpayers receive the full value, while it phases out for the highest-income taxpayers, who would be more likely to save the money. In addition to ensuring that most of the money gets spent, these five major direct assistance programs have injected the money into the economy quickly and efficiently by using existing mechanisms for distribution of the funds. The provisions for additional food stamp and unemployment insurance benefits and for a one-time Economic Recovery payment have used established programs to deliver assistance. The Making Work Pay credit reaches most individuals in their paychecks, through a reduction in withholdings. Four of the provisions began to put money in the hands of individual Oregonians within a few weeks of the signing of the Recovery Act in February 2009. The fifth, the one-time Economic Recovery payments, mostly went out in May 2009. 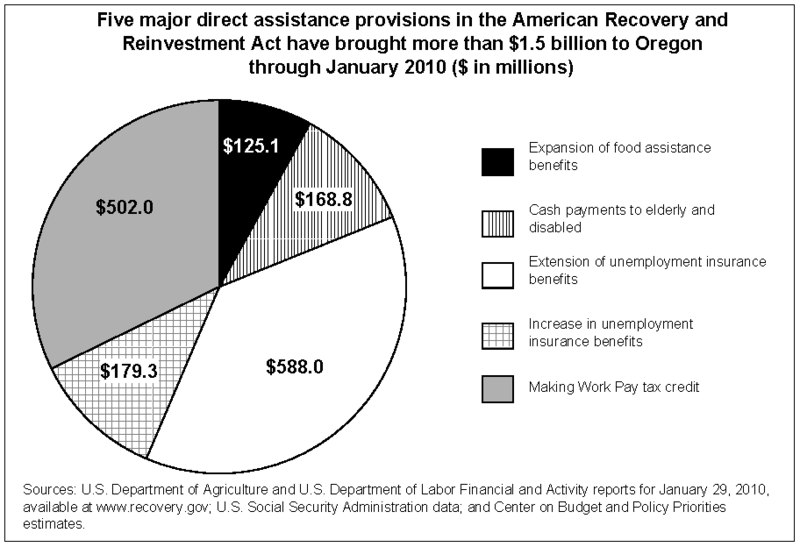 The Recovery Act has succeeded in preserving or creating jobs in Oregon and in spurring economic activity. The five major direct assistance provisions discussed here have played an important role in that success. While economic recovery is still eluding too many Oregonians, the act has helped Oregon’s economy. Note: Estimates are based on funding received through January 2010; one-time Economic Recovery payment estimates do not include payments made through the Department of Veterans Affairs and Railroad Retirement Board. Sources: OCPP estimates based on weekly financial activity reports from the U.S. Department of Agriculture and U.S. Department of Labor, www.recovery.gov; U.S. Social Security Administration data; Oregon Department of Human Services, Self-Sufficiency Programs, Branch and District Data; Oregon Employment Department, unemployment insurance data and Local Area Employment Statistics; and Center on Budget and Policy Priorities estimates based on Department of Treasury estimates of Making Work Pay outlays. Council of Economic Advisors (CEA), The Economic Impact of the American Recovery and Reinvestment Act of 2009, January 2010, table 7, p. 25. CEA, Economic Impact, table 8, p. 26. CEA, Economic Impact, table 5, p. 21. CEA, Economic Impact, table 9, p. 28; and Recovery.gov. CEA, Economic Impact, p. 27.
 Business Oregon in cooperation with Oregon Employment Department and Office of Economic Analysis, The American Recovery and Reinvestment Act of 2009: The Estimated Employment Impact on the State of Oregon, October 2009, available at oregon.gov/recovery/docs/economic_analysis_final.pdf. PricewaterhouseCoopers/National Venture Capital Association, MoneyTree™ Report, data provided by Thomson Reuters, historical trend data, available at www.pwcmoneytree.com/MTPublic/ns/nav.jsp?page=historical. Venture capital investments in Oregon totaled $1.47 billion from 2001 through 2009. The estimate of total benefits to Oregon is conservative because it is based on the original provisions of the act and does not account for subsequent extensions of unemployment benefits. Oregon Department of Human Services, Recovery Act weekly reports, available at www.oregon.gov/DHS/recovery/data.shtml; U.S. Social Security Administration, Economic Recovery payment data; Oregon Employment Department, Recovery Act page, www.employment.oregon.gov/EMPLOY/recovery/index.shtml; OCPP estimate of Making Work Pay credit in Oregon based on Joint Committee on Taxation, Estimated Budget Effects of the Revenue Provisions Contained in the Conference Agreement for H.R. 1, the “American Recovery and Reinvestment Tax Act of 2009,” February 12, 2009, available at www.jct.gov/x-19-09.pdf, and Arloc Sherman, Tax Aid in Recovery Package Would Reach Large Numbers of Workers in Every State, Center on Budget and Policy Priorities, updated February 26, 2009, available at www.cbpp.org/files/1-21-09tax3.pdf. USDA, Food and Nutrition Service Recovery Act website, Supplemental Nutrition Assistance Program, www.fns.usda.gov/fns/recovery/recovery-snap.htm. Oregon Department of Human Services, Self-Sufficiency Programs, Branch and District Data, available at www.oregon.gov/DHS/assistance/data/papage.shtml. U.S. Social Security Administration data, representing payments to recipients of Social Security and Supplemental Security Income. Does not include payments made through the Department of Veterans Affairs and the Railroad Retirement Board. EUC originally provided up to 33 additional weeks of benefits and was set to expire in March 2009. The Recovery Act extended it through December 2009. In November 2009, Congress added up to 20 additional weeks of benefits, for a total of up to 53 weeks of EUC benefits (Public Law 111-92). Congress has since extended the program (PL 111-118, 111-144), without adding additional weeks, through March 2010, and it is considering extension through the end of 2010. The increase initially ran through the end of 2009. Congress has since extended the provision through March 2010 (PL 111-118, 111-144) and is considering extension through the end of 2010. Oregon Employment Department, Monthly Claims Activity by Field Office, count of new initial claims for regular, Extended Benefits, and Emergency Unemployment Compensation programs, March 2009 through January 2010. Internal Revenue Service, “The Making Work Pay Tax Credit,” www.irs.gov/newsroom/article/0,,id=204447,00.html. Arloc Sherman, Tax Aid in Recovery Package Would Reach Large Numbers of Workers in Every State, Center on Budget and Policy Priorities, updated February 26, 2009, available at www.cbpp.org/files/1-21-09tax3.pdf. Mark Zandi, “The Impact of the Recovery Act on Economic Growth,” Testimony before the Joint Economic Committee, October 29, 2009, p. 3, available at jec.senate.gov. Higher-income households do not spend all of their income, so a portion of a tax credit that goes to such households will go into savings. This limits the economic stimulus effect of the credit. The Making Work Pay credit phases out for married couples earning over $150,000 (over $75,000 for other taxpayers), becoming unavailable to married couples earning more than $190,000 (over $95,000 for others).